What do we mean we hen we say we have to take measurements? To create tatami that fits without gaps and has clean lines it is critical we measure the space. No room is perfectly square and any slight mis-calculation means the tatami won’t fit. Tatami measurement is taken differently to a general carpenters or an architectural measurement. Why should measurements be taken? We can not guarantee it will fit without measuring the space. Each tatami has its own place in the room and is created to reflect that so it sits flush. Your room does not have perfect 90 degree angles. 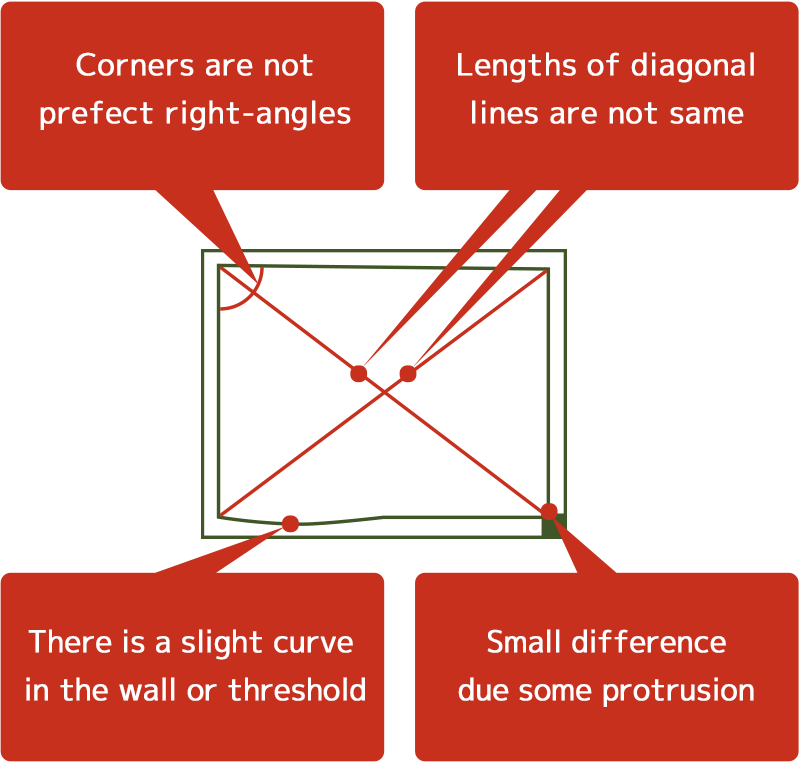 All rooms have some differences in size or angle of the corners compared with the size written on the design drawing. However good the carpenter may be, he or she can never build the house in the precisely same as the design. Normally, the precise size of your room doesn’t matter. But in order to cover the space with tatami, without gaps, an exact measurement is necessary. This is for old and new architecture, as well as space that has already had tatami laid. What happens if tatami is made without taking measurements? 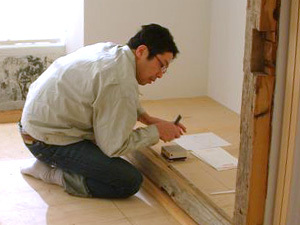 Making tatami without taking precise measurements will cause problems when tatami are installed. Gaps may be present and this makes the tatami look unfinished and uneven. This is due to the difference in size, a corner not at 90 degrees, weight bearing posts sitting out from the wall, or slight curve of the wall. There will be some space between tatami and the wall. Without taking precise measurements and installing tatami to cover the whole room, there definitely will be some space/gaps between the wall. If there is a space between tatami and the wall, it will gather dusts and encourage bugs. If the tatami can move it will be damaged and uneven, causing a tripping hazard. Tatami has some shrinkage as it ages so if there are gaps they will increase in size as time goes on. If the room is smaller than expected, or it has protrusions or curves, obviously tatami cannot be installed in the room. You may think, “tatami is so soft that it can be pushed in”. But by doing so, igusa will be put under extreme strain, which leads to further damage. 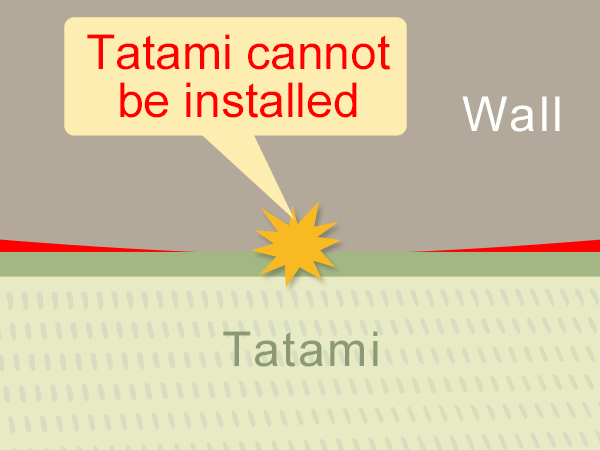 In case tatami cannot be installed, it has to be remade – increasing costs. *We very rarely make tatami without taking the measurement but if the client insists we can not guarantee it will fit, and strongly advise against forgoing the measurement process. 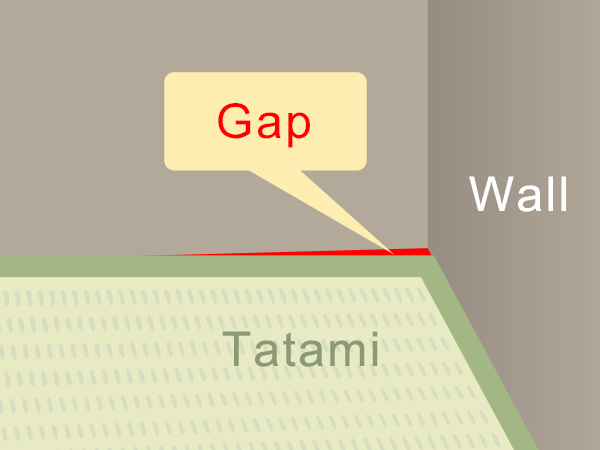 Due to the curve or projection, there may be some gaps, and tatami cannot be installed. If you have any inquiries on measurements, please contact us. If you have furniture on your tatami, or in your space we carefully move it before taking measurements. Our price of tatami includes cost of taking the measurements. *Outside the free visit service area, travel costs for the working staff is additional. Please contact us for more details.